In 1942, Russia was fully engaged in a battle for its very survival along the Eastern front. Stalin was demanding that the Allies open a second front in the West. Britain had tried day bombing, but it had proven too difficult to protect its pilots in the daylight, and many pilots and aircraft were lost. Neither Britain nor the United States was anywhere near ready to conduct a land invasion of Europe, but both nations might offer such aid as an air attack might bring. At the end of 1942, the British Chiefs of Staff called for “the progessive destruction and dislocation of the enemy’s war industrial and economic system, and the undermining of his morale to a point where his capacity for armed resistance is fatally weakened.” No fleet of bombers could yet accurately deliver enough high explosives to raze a city. But if the bombloads were incendiary, then massed aircraft might combine their destructiveness. Here Richard Rhodes is setting up the discussion at the end of the book in which the reader engages in the ethical choice to drop the atomic bomb on Japan, or commit 200,000 men to a land invasion of Japan, possibly losing many or even a majority of them. This book is a technical, sobering and difficult read, but highly recommended. It is meant only for the serious thinker. The pendulum has swung to its apex in the opposite direction. A recent Washington Times commentary gives us food for thought concerning application of rules of engagement in combat action in Afghanistan. Now that Marcus Luttrell’s book “Lone Survivor: The Eyewitness Account of Operation Redwing and the Lost Heroes of Seal Team 10” is a national bestseller, maybe Americans are ready to start discussing the core issue his story brings to light: the inverted morality, even insanity, of the American military’s rules of engagement (ROE). On a stark mountaintop in Afghanistan in 2005, Leading Petty Officer Luttrell and three Navy SEAL teammates found themselves having just such a discussion. Dropped behind enemy lines to kill or capture a Taliban kingpin who commanded between 150-200 fighters, the SEAL team was unexpectedly discovered in the early stages of a mission whose success, of course, depended on secrecy. Three unarmed Afghan goatherds, one a teenager, had stumbled across the Americans’ position. This presented the soldiers with an urgent dilemma: What should they do? If they let the Afghans go, they would probably alert the Taliban to the their whereabouts. This would mean a battle in which the Americans were outnumbered by at least 35 to 1. “Little Big Horn in turbans,” as Marcus Luttrell would describe it. If the Americans didn’t let the goatherds go — if they killed them, there being no way to hold them — the Americans would avoid detection and, most likely, leave the area safely. On a treeless mountainscape far from home, four of our bravest patriots came to the ghastly conclusion that the only way to save themselves was forbidden by the rules of engagement. Such an action would set off a media firestorm, and lead to murder charges for all. It is agonizing to read their tense debate as Mr. Luttrell recounts it, the “lone survivor” of the disastrous mission. Each of the SEALs was aware of “the strictly correct military decision” — namely, that it would be suicide to let the goatherds live. But they were also aware that their own country, for which they were fighting, would ultimately turn on them if they made that decision. It was as if committing suicide had become the only politically correct option. For fighting men ordered behind enemy lines, such rules are not only insane. They’re immoral. The SEALs sent the goatherds on their way. One hour later, a sizeable Taliban force attacked, beginning a horrendous battle that resulted not only in the deaths of Mr. Luttrell’s three SEAL teammates, but also the deaths of 16 would-be rescuers — eight additional SEALS and eight Army special operations soldiers whose helicopter was shot down by a Taliban rocket-propelled grenade. It might have been that firing on the goatherds would have divulged their position to the enemy. But assuming the accuracy of the scenario given to us above, i.e., it is possible for Luttrell and his team to have killed the goatherds and avoided the combat caused by divulging their position, then a different choice should have been made in this instance. Another complicating factor is that the Luttrells’s team could only surmise that the goatherds would give away their position. They could not know with absolute certainty. In the end, they were right in their suspicion, but either way, the moral of the story is that in such situations certainty is not possible and thus should not be required. No one wants to see civilians burning in streets of melted asphalt. Similarly, no one wants to see teams of U.S. forces hamstrung by rules that are made out to be rigid and inflexible when taught to them, but which cannot possibly be applied that way in a broken and complex world. Latitude and professional judgment should be the order of the day. A pendulum that isn’t swinging is the best approach. Postscript: This article has elicited a visceral reaction. Just to cover a few basics, (1) yes, I know what the LOAC is, (2) no, I am not advocating changing it, or even the written ROE, necessarily, (3) my position is somewhat more nuanced than that, with greater emphasis on judgment during battle, and more discrete judicial and prosecutorial temperament, and finally (4) no, allowing the killing of U.S. troops didn’t “win hearts and minds” in Afghanistan. The world over, the word Marine defines something more than a soldier. It arouses the image of a warrior on the boundlessness of the oceans, coming from the mystique of the sea onto the land – an amphibian, a soldier of the sea. The aura is of one who is different and of whom more is expected … This is The Corps, the strongest brotherhood in the world (The Marines). Michael Yon is a clearheaded reporter and diligent – even relentless – embedded blogger. Every article he writes is worth reading, and then reading again. But permit us a spirited response to one of his statements in The Ghosts of Anbar, Part II of IV (actually, Michael is quoting others at this point). Arrowhead Ripper was merely the latest experience that underlines the Army’s rapidly-growing expertise. Yet the Marines have adapted faster and seem poised to win the war in their battle space. In fact, it’s been Army officers who have told me repeatedly over the past several years that nobody is successfully morphing to meet this war faster than the Marines. Of course, Army officers who compliment Marines always say, “But that didn’t come from me. In Operation Alljah and the Marines of 2nd Battalion, 6th Regiment, we interviewed Lt. Col. William F. Mullen who gave us a realistic but positive report on the accomplishments of the Marines in Fallujah. As expected, we received e-mail from detractors (is Fallujah really this much better off?). There are also reports that take the same facts and turn them into a completely different interpretation than the one we published. We have also published extensively on the calamity in Basra, the British having essentially lost the military struggle for Basra and surrounding areas. True to form, this assessment has also been questioned by detractors. But even the British are finally managing to turn their gaze towards just how bad the situation is in Basra. Like Donald Rumsfeld, the man British commentators love to hate, we never sent enough troops to Iraq. At first we were pretty condescending to the Americans, insisting that our light touch, learned in Northern Ireland, was far more effective than their alleged heavy-handedness. We were wrong. Basra is not Londonderry. Our ever-lower profile was seen by local militias — and the public — as weakness. As a result the militia grewstronger and stronger, and now Basra is a town of warring gangs. We never committed enough — and we reduced our numbers much too soon. We now have only 5,000 men and women in Basra. That small force must protect itself, must continue training the 10th Iraqi Division. The U.S. has also begun to divulge the sensitivity of the situation. “This is less an insurgency issue than it is criminal, a borderline Mafia kind of situation. You’ve got competing criminal interests looking for territory down there,” said Geoff Morrell, the Pentagon’s press secretary. “So that has certainly complicated matters for the Brits down there, and it certainly remains a concern for us,” he told reporters. Britain has 5,500 troops in Basra but almost all have been pulled back to the airport where they are training Iraqi forces. This admission may be gratuitous. Beyond criminal activity, three strong, competing Shi’a factions are at war with one another and openly demanding protection money from the population: Jaish al Mahdi, the Fadhila Party, and SIIC (Badr). So what is the relationship between Basra and Anbar, and is there any acendotal evidence to back up these analyses? The best on-the-scene evidence comes from Omar Fadhil of Iraq the Model, who assesses the reversal of roles between the Shi’a south and the Sunni West in Crossing Anbar. We’ve been getting some reports about the improvement in security in Anbar in the last few months but little was said about the highway that runs across the province. The several hundred kilometer western section of the international highway is technically Iraq’s second “port” in a way as it connects Iraq with Syria and Jordan and was for years the only window to the world when all airports and the southern ports in Basra were closed to traffic in the 1990s. This is good not only for Iraq’s economy and traveling but also for the American troops who can use this road as an alternative supply route in case the British troops withdraw and leave the strategic southern highway between Kuwait and Baghdad unguarded. Back to the story; there are two travel plans for passenger SUV’s and buses from Damascus to Baghdad; one includes leaving Damascus between 10 pm and midnight, reaching the Syrian border control before dawn, entering the Iraqi border control at 8 am and arriving in Baghdad around sunset. A total of approximately 20 hours with 6 to 7 hours lost in waiting and passport control. The second plan includes leaving Damascus at noon and here convoys carrying the passengers continue to move all the way until a short distance northwest of Ramadi. At this point the time would be between midnight and 2 am and since that’s within curfew hours in Baghdad, the drivers park their vehicles and everyone gets to sleep 3 or 4 hours and wait for the sun to rise and then the journey would continue. Now the first plan sounds predictable, safe and well planned given the distance and necessary stops. But look at the second one carefully and try to picture the scene; dozens of passenger SUV’s (GMC trucks mostly) and buses parking in he middle of nowhere in a zone that was until recently the heart of al-Qaeda’s Islamic state! Obviously the drivers and families feel safe enough that they know they won’t be robbed and slaughtered by cold-blooded terrorists. Even more interesting, this parking and resting zone was not designated nor protected by the Iraqi or American forces but simply an arrangement the drivers managed on their own perhaps with cooperation from the local tribes. I still laugh every time I think of this incredible change and I honestly wouldn’t have believed it if the story teller wasn’t my father. Now, I’m ready to try the trip through the west, but going south through the militia infested land is something I’d never dare do at this stage. The reports on the pacification of Anbar are indeed correct, and sadly, the British failure in Basra has made Operation Iraqi Freedom much more complicated. In Instructions on How to Repair the Electrical Grid in Iraq, we made the case that the electrical grid was too delicate, complicated and far-flunge to be amenable to protection against insurgents (in this case it was the Jaish al Mahdi who was targeting the electrical grid, destroying parts of it and in other cases hijacking the power for local use). Another example of this same tactic comes to us from a different region of Iraq; this time the example comes from the Diyala Province, and is likely perpetrated by al Qaeda in Mesopotamia. The US military says its troops have killed 33 insurgents in a joint operation with Iraqi troops 80km (50 miles) north of Baghdad. It said several hundred US and Iraqi soldiers took part in the operation on Monday to reopen the water supply to the town of Khalis. Residents say al-Qaeda fighters have a strong presence in the area. Insurgents cut water supplies to Khalis several days ago by shovelling earth into an irrigation canal. The US military said a joint assault force of US and Iraqi troops – which landed by helicopter – killed 13 insurgents. It said fire from attack aircraft killed 20 others. It is not possible to deploy enough troops to protect all infrastructure when making it dysfunctional simply involves shovelling dirt into an irrigation canal (most likely a weir type of structure). There are too many kilometers of canals to protect. This isn’t to deny that there is a complex interplay between the availability of goods, services, security and government, and the population informing on insurgent identities and locations. Counterinsurgency remains a difficult venture. But it is to say that when the impossible presents itself (i.e., protect all infrastructure, whether electrical grids, water supplies, or other utilities such as sewage, in order to win the population), the stipulations are unacceptable and the game must be reformulated. Coalition forces implemented the correct tactic to restore basic services. They targeted those who targeted the infrastructure. The deployment of the newly upgraded Fairchild Republic A-10C Thunderbolt II bomber-attack aircraft in Iraq next month will make it easier for the US Air Force (USAF) to provide close air support to ground troops, according to the commander of USAF’s Air Combat Command, General Ronald Keys. However, more extensive upgrades are still needed to keep the aircraft on top of its game, he said. General Keys said the USAF’s modernisation plans for the A-10 ‘Wart Hog’ have been held back from their full potential by bureaucratic wrangling and congressional resistance. “This is not the super Hog we envisioned but this is a better-than-average Hog,” Gen Keys said during a ceremony to announce initial operational capability of the A-10C at Langley Air Force Base in Virginia on 21 August. Despite voicing frustration with the overall pace of A-10 modernisation, Gen Keys said the USAF was off to a good start with the USAF’s Precision Engagement programme, which aims to upgrade all 356 aircraft to the A-10C configuration by 2011. The modifications to the A-10C were significant. The A-10’s enhancements included, among other modifications, new sensors that allow the fighter to “identify and strike targets from higher altitudes and greater distances,” according to the Air Force. Courtesy of Dailypress.com. We only disagree on one count: ugly aircraft! Nay, and in the superlative degree. She’s a beauty! Watch it all. Faster kill chain. Just so. The New York Times brings us a story about the electrical system in Iraq, its unreliability, and the nexus with militias and gang control of the countryside. Armed groups increasingly control the antiquated switching stations that channel electricity around Iraq, the electricity minister said Wednesday. The temptation in response to this is to contemplate ways to make the electrical grid more reliable. But the story has what lawyers call a misdirect at the very beginning: ” … antiquated switching stations.” This point is entirely out of context, and in fact not very meaningful or important. All electrical grids are designed the same way. They are interconnected, have thousands of miles of unprotected high voltage cable, important switching stations, step up and step down transformers, protective relaying, and breakers to isolate ground faults. They are by their very nature finicky and touchy things, and while the grid in Iraq may be antiquated, the real problem is not the grid. It is those who target the grid. The Iraqi electrical grid problems are unrelated to engineering. To be sure, as soon as security has been restored to Iraq, we can turn loose the electrical transmission engineers who would love to reconstruct the system. But this step awaits security. The moral of the Iraqi story on electrical grids is just this: let’s let the electrical engineers work on the electrical system. Let’s let the U.S. Army and Marines work on targeting the enemy, which includes the JAM, whether we want to admit it or not. Sometimes our efforts at counterinsurgency by winning hearts and minds simply have to go through kinetic operations — in this case, combat action — to “close with and destroy the enemy by fire and maneuver.” There are no easy ways to do this, and we cannot throw enough money at or deploy enough engineers on this problem to make it go away. Lt. Col. William F. Mullen who commands the 2nd Battalion, 6th Marine Regiment (currently at Forward Operating Base Reaper on the South side of Fallujah), gives us an exclusive look into Operation Alljah and what has been accomplished in Fallujah. His discussion is both informative and interesting, and points to modifications and adjustments to the template used in the Anbar Province. Every city and engagement has been a unique experience, but the adaptability of the United States Marine Corps has proven to be one of the most effective weapons in their arsenal. 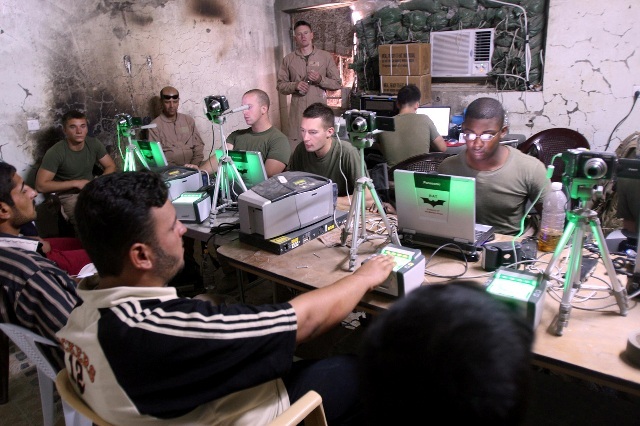 Marines take fingerprints, iris scans and other information from Iraqi citizens using the Biometrics Automated Toolset in an Iraqi Police precinct in Fallujah on July 19. TCJ: Lt. Col. Mullen, thanks for the chance to interview you on the hard work and accomplishments of 2nd Battalion, 6th Marines in Fallujah. Operation Alljah seems to have had multiple phases. For instance, the Multi-National Force issued press releases on June 5th, 7th, 8th, 9th and 10th on kinetic operations against the insurgency and terrorists. Can you describe this part of the operation for us? For instance, since the so-called Anbar Awakening came somewhat late to Fallujah compared to Ramadi, how did 2/6 identify the insurgents? Lt. Col. Mullen: Well, to help clarify, many times MNF-W identifies attacks or kinetic events as happening in Fallujah, but they mean the Fallujah area. There has been a great deal going on in the smaller towns outside of the city to curtail enemy activities out there and keep them from trying to return to the city. We have had some small events in the city, but overall, it has been very quiet. The latest big event we had was on June 2nd when we conducted a raid with the police that killed 7 enemy, captured 8, found two truck bombs before they went off, IED making material and other enemy supplies. Three of the dead enemy had suicide vests on and they were killed before they could set off the vests. This was a great operation based off of intelligence that the police had gained. We have also been conducting quiet little cordons and searches on houses based off of more tips from the civilian population and are picking off the enemy one or two at a time. They never fight when we do this because we are too strong for them and this is having a serious demoralizing effect on the enemy. We had a serious sniper problem in the city when we first took over and it is gone for all intents and purposes now. We detained 11 suspected snipers and killed two. They now operate well away from the city. As for the awakening, that is more of a tribal thing. Tribes have little influence inside Fallujah because of how mixed up the population is. They are all solidly against AQI though, because they want nothing to do with their extremist agenda and are appalled by the tactics AQI is using. As just one example, in an area NE of the city, AQI herded 12 women and children, all relatives of a prominent area Sheik who had declared himself against AQI, into a building and blew it up on them killing them all. That is the type of rabid dog enemy we all face out here. They are cutting off their nose to spite their face and the average Iraqi wants nothing to do with them. TCJ: It seems as if the police of Fallujah have managed to assist and work together in the pacification of Fallujah, with the Marines doing a lot of the heavy lifting in the way of combat operations in the initial stages of Operation Alljah. Can you describe the working relationship between the Marines and the police? Lt. Col. Mullen: The relationship between us and the police is very good. At the start of ALLJAH, they were centrally located in the HQ in the middle of the city. They were afraid to go home in uniform, some never went home at all, IP houses were getting blown up or burned down, some would get assassinated on their front doorsteps, etc. When they went out to do a raid, they went out in force and scared to death. Now they are spread all over the city in precincts supported by over 1400 neighborhood watch personnel. They not only go home now, they do so in uniform proudly. They used to always wear masks over their face so they would not be recognized and targeted off duty – few do that now. They have a lot of logistical support issues, but we are working hard to iron them out and make them self sufficient. They are brave (at last count they had lost over 200 police since they were reestablished in mid 2005) and genuinely want to restore security to their city. They are well on their way. We know they have corruption issues – it is a cultural thing that is much more acceptable to them than it is to us – and they are infiltrated by the enemy, but all of these things are issues they are specifically working on. Given the track record of our own police departments, I’d say they are doing pretty well. We implemented a professional development program for them using actual American Police officers that have come over to train police here and it is starting to reap positive results. They have a long way to go, but are moving with a purpose in the right direction. TCJ: Working with erstwhile insurgents to turn them against the insurgency and terrorists has been called a risky strategy by some, and of course, any strategy comes with risks. But it would seem that working with the insurgents and using their services against the very violence they at one time perpetrated is part of the genius of the approach. Can you describe how this has occurred in Fallujah? Lt. Col. Mullen: We aren’t really doing that here in the city. I am sure that there are former insurgents in the police and neighborhood watch – which is why I tell my guys that we can never completely trust them – but we have not had a single instance where we took a known insurgent and turned him to our side. We continue to target them heavily and most have either been detained, or fled the city. The ones remaining spend a lot of time trying to keep from being detained instead of planning on how they will attack us. We keep the pressure on them to keep them off balance and on the run. That is having the best effect in the city. TCJ: It appears that you have made signficant use of the concept of “gated communities” in Fallujah in order to bring security. I noted that there is also a temporary ban on vehicle traffic that will be lifted soon. Can you describe how the ban has helped and what the role of the gated communities has been? How successful has this tactic been? Lt. Col. Mullen: The gated community idea was implemented because the enemy uses cars almost exclusively to conduct their attacks. The barriers emplaced allow the citizens of each precinct to choose who they want to come into their area, and makes it difficult for the enemy to move around and escape in a vehicle. The vehicle curfew was implemented by the Mayor and Police chief due to several suicide vehicle bomb attacks, one of which was particularly horrific. There was a funeral for an Iraqi that had been fighting AQI and AQI had a suicide bomber drive right into the funeral procession and blow himself up. 20 civilians were killed and 17 were injured. 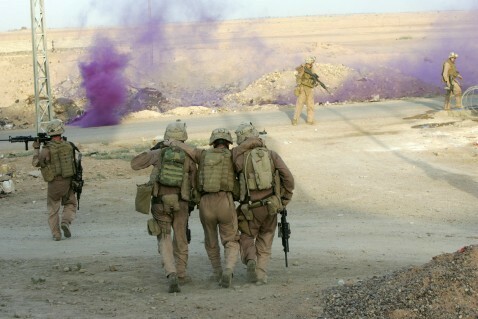 This was a watershed event here in Fallujah. We were not confident that a vehicle curfew could be implemented, but it has been, almost solely by the police and in conjunction with the barriers we have been emplacing, and it has resulted in a three-fold decrease in enemy attacks. The people do not like the barriers or the curfew, but they do like the security and indicate they are willing to put up with them to keep the security. TCJ: To what extent have you utilized COPS (variously called Combat Outposts and Combat Operation Posts) as part of Operation Alljah versus the more traditional military doctrine of force protection? Lt. Col. Mullen: We do use Combat Outposts, but in this case, we call them Joint Security Stations. We have Marines partnered with IP at every precinct HQ. Force Protection is a constant, so we make sure each site is protected against suicide bombers and sniper fire, but we also ensure that the HQ is accessible to people on foot. It is a difficult balance, but it is absolutely necessary. Being out amongst the population is the only way to finish this fight. Driving to work means you miss a lot. Also, at least initially, the police would only stay in the precincts if we were there with them. They were pretty intimidated. This is no longer the case. They know we have their back while they grow stronger by the day. TCJ: It appears that the transition to nonkinetic operations was fairly stark. Press reports about combat operations stopped and press reports about construction of police precincts started. In a professional military academic climate that claims that standard counterinsurgency takes ten to twelve years, how did the Marines of 2/6 manage to pull this off? Lt. Col. Mullen: We got the citizens of the city involved in providing their own security through the neighborhood watch system. We pay them a pittance of $50 a month (only a part time job as an extra set of eyeballs for the police – they are not police) and we authorize them to carry a weapon if they have one for their own protection. As I said above, the result has been a three-fold decrease in enemy attacks. We also give the people a serious reason to stay on this side of the fence – we call it the “What’s in it for me?” program. We have a heavy civil affairs emphasis that is changing the face of Fallujah. In addition to the essential infrastructure improvements noted above, we are hiring them to pick up rubble and garbage, to paint cement barriers and school walls with murals (negates graffiti) and we are putting them to work in every way we can think of so they can put food on the table for their families. Progress has been astounding and whenever we measure atmospherics (several times a week) all indications are that we are having a tremendous amount of success. We have tied all of this to the improvements in the security situation and we tell them that if they want it to continue, then the enemy has the be driven out completely and kept out. They understand and are providing a great deal more tips than they used to. The enemy has not been able to do much of anything of late and we just passed the three month mark without having a single casualty from this battalion as a result of enemy action. That is unheard of in Fallujah. TCJ: In the accelerated environment in which the Marines work, how concerned should we be about the potential stand down of U.S. forces in Fallujah in 2008? How soon will the police be trained, funded, cohesive and able to work alone in the security of Fallujah? Lt. Col. Mullen: The police are watching activity in the US as much as we are. They are getting better, but if we pull out early, it could have a serious detrimental effect. I think they will manage to remain in control, but it will not be pretty. They have a way of muddling through that makes us cringe, but it does work for them. We certainly need to finish what we started, but pulling out would not be an unmitigated disaster here in Fallujah. Neither the police nor the citizens want us to leave any time soon because they fully recognize what is happening around them and want it to continue. TCJ: How badly has the lack of political reconciliation harmed the efforts to pacify the Anbar Province and in particular Fallujah? It seems that there is still much animosity between Fallujah and Baghdad. Lt. Col. Mullen: I cannot comment too much on the political situation in Baghdad, but the people here do not like the Iraqi Government and blame them for all the shortcomings in fuel, food and essential services. I will say also though that things are rarely as bad as the Iraqi’s make them out to be. They are prone to serious over exaggeration and always want to blame someone else. It is never their fault. For example, fuel arrives in the city, but to make extra money, the truck drivers sell it to “free enterprise” folks that then sell it curbside from plastic jugs – it is known as black market fuel where we come from. They charge much more than normal and keep the fuel from getting to the gas stations and city government in enough amounts to keep them open and operating. They also tap into electrical and water lines illegally to get better service, all of which seriously degrades the overall service provided. The city government is working on these things, but they all contribute to the problems Fallujah is having, and the Fallujans blame it all on the “Iranians” who make up the current government. In the general opinion here, only Sunni can run a country properly, as they have until the past few years. You also have a hard time convincing them that they are a minority. The things they come up with really are amazing at times. It is only a semi-literate society though so word of mouth, despite how illogical or ridiculous the rumor, has a big impact – especially if it is along the lines of what they want to believe. TCJ: Can you describe any actions by NGOs or U.S. forces to help the people of Fallujah with utilities (e.g., power and water)? Lt. Col. Mullen: Our Civil Affairs, the US Army Corps of Engineers and USAID have all teamed up to restore basic infrastructure in the city of Fallujah. They have been trying to do this for several years now, but the security situation was not conducive to making much progress. Major projects stalled due to the lack of security and both electricity and water were becoming scarce in the city. Complaints were frequent and fully justified. All of this has been turned around due to Operation ALLJAH. All major projects have been restarted, the electricity and water services are being restored and people are very appreciative. As a recent example, one of our patrols was trying to get some atmospherics in one of the neighborhoods of Fallujah and could not find anyone out on the streets. This is normally a bad sign. They knocked on some doors and found that everyone was inside enjoying the air conditioning and satellite TV because they had reliable electricity. It isn’t on 24 hours a day (they never had this even before Saddam was toppled) but we are working towards that. Water is plentiful now also as you can see cars and sidewalks getting washed, vegetation getting watered, and children playing in the water from hoses. TCJ: I have called the the counterinsurgency campaign by the Marines in the Anbar Province one of the greatest in history. I believe that it will be discussed and taught as part of advanced warfighting for years or even decades to come. How much attention has Operation Alljah received, and how do the Marines of 2/6 feel about their accomplishments? Lt. Col. Mullen: I’d say that the jury is still out on the claim to be the greatest counterinsurgency campaign in history, especially because we cannot say that we have won it yet. It looks that way, but a lot can happen between now and when we leave. Even more can happen after we leave. These types of wars cannot be properly judged until many years later. If Iraq pulls itself together and rejoins the community of nations as a well respected and contributing member, then we have been successful. If it collapses in civil war or anarchy and we end up with a situation like there was in Afghanistan under the Taliban, then no matter how well 2/6 did, we will have failed overall. ALLJAH has gotten some attention at some pretty high levels as an example of something that could work in other places in Iraq and this is always good. As for how we feel, we are amazed by the progress and greatly encouraged by it. Whereas last year, the battalion returned from a difficult 7 month deployment where they lost 12 of their comrades and had many wounded with precious little evident progress to show for it, this time we have taken few casualties and the progress is incredible. All of the Marines and Sailors see it and are proud of what we have been able to do to date. They all comment on it when I talk to them and it is very encouraging. We have frequent high level visitors and they all comment on how well we have done here in Fallujah. It is obvious to all who see it in person. In Calamity in Basra and British Rules of Engagement, we pointed out that the British had essentially been militarily defeated in Basra.